This is the first graphic novel I’ve reviewed for the site and, wow, this one is awesome. Acropolis is under siege by monsters. Their only hero is Haggard West, who has used scientific research to design a way to fly AND (of course) to build himself a pretty sick gun that causes targets to burst into flame. Unfortunately, the Ghoul Gang (a cross between ninjas, mummies, and cobra commander) has a plan for Haggard West. 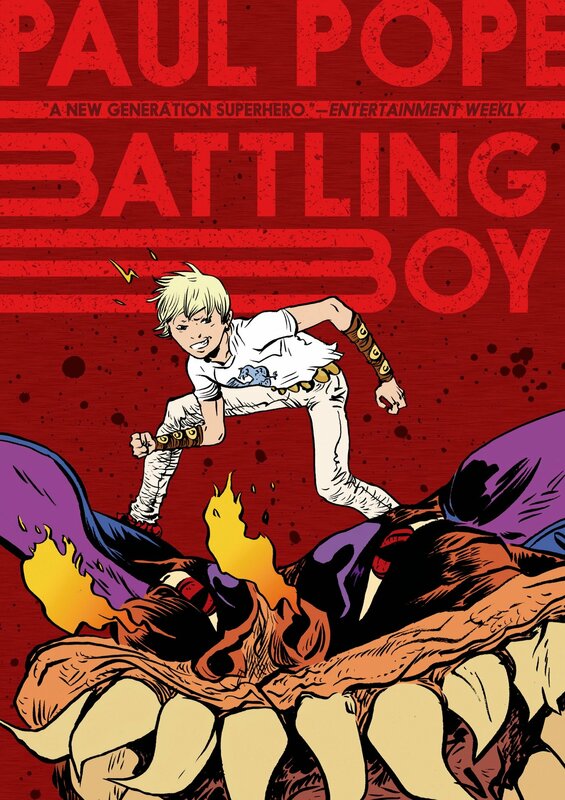 On a different plane of existence, Battling Boy is rounded up by his brute-force, monster-slaying god of a father and sent to Acropolis to battle its monsters and gangs. It is a coming of age process that all 12 year-olds go through. I love the creativity at work here. There are spiders who weave armor. Cthulu can be found hanging out in the villains’ bar. The mayor has a PR team to manage Battling Boy’s image. The artwork is explosive and brilliant. Pope’s linework is manic, his monsters are Ralph Steadman versions of nightmare kaiju. Battling Boy’s super-macho father is a hilarious spectacle of muscle and violence. The color symbolism is clear: the Ghoul Gang is dressed in dark clothes, Battling Boy wears all white. There’s also the matter of Aurora West, daughter of Haggard. She doesn’t get much panel-time in this volume, but all of it is fascinating. 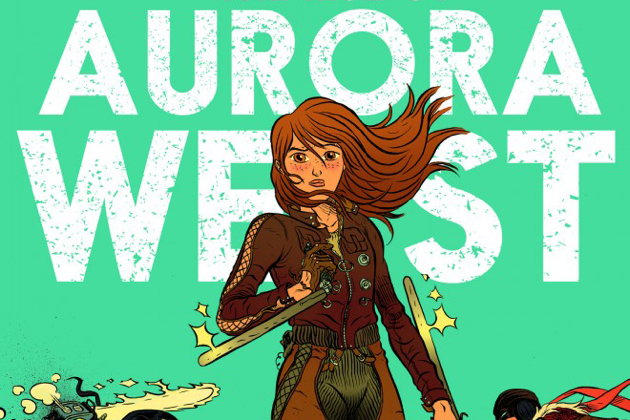 The second volume of the story is titled THE RISE OF AURORA WEST and I suspect it will shine much more light on her and her life. I can’t wait to read it! “A” wakes up in a different body every day. He takes over some teen’s consciousness, spends a day, and then moves on to the next one. The process is, as far as A can tell, random. Sometimes A wakes up in a guy’s body, sometimes in a girl’s. It’s a life that’s not really a life at all, because A never gets to live out a full story. New day, new story. The concept is brilliant. A has lived through a lot: dead end relationships, drug addicts, depressed teens. A doesn’t fully understand human connection, because he (or she or whatever) never stays in one place for long. His life changes when he meets Rhiannon and finally finds a real connection with someone. EVERY DAY is a new spin on teen romance. A’s constant reincarnation is chaotic and his pursuit of Rhiannon is a seemingly impossible task. How can he manage to reach her when he’s someone new every single time? THE 5th WAVE has everything going for it: it’s a post-alien-apocalypse novel. It has guns. It has romance. It has valiance. It has strength. You should get a copy as soon as you can. Everything begins with Cassie. She is alone and frazzled and living on the run. There’s no one left for her to trust, unless you count her gun as a person. Which, all things considered, isn’t such a crazy thought. That gun is a lot of things for her: the means for hunting, a reminder of her family, the equivalent of a security blanket. Cassie is one of the last humans. She survived the first wave of the alien offensive and the ones that followed, watching as humanity dwindled and their extra-terrestrial observers remained untouchable in the skies. She carries her past like a boulder and the future isn’t looking all that rosy. Yancey’s novel is a corner-to-corner winner, never ceasing to intrigue and always full of new surprises. You’ll find nail-biting moments buffered by incredibly tender scenes. Because when your world is falling apart, every moment is a big one, and you take solace when you can find it.